Filed to: We're In!Filed to: We're In! We're here in a nice old building in New York's Chelsea district to check out the unveiling of Motorola's new phones. First up was Ming touchscreen clamshell. Then Q smartphone refresh: the Q8 and 3G-capable Q9. Next was ROKR Z6 music phone and Moto Z8 entertainment phone. Coup de grace: RAZR 2. 10:55 - Ed Zander: "RAZR is not just a product, it's a brand, a brand we'll continue to market for years to come. Over 98 million RAZRs sold. This quarter, 100 million RAZRs worldwide. I believe it's the fastest selling consumer device ever. Five new colors for GSM markets. But..."
RAZR 2 - Super thin, super strong, RAZR 2: Worlds ultimate feature, style fashion phone - larger 2-inch display on outside. Twice the brightness and 10X resolution. Vacuumized metal front. Stainless steel and cast aluminum housing support. More scratch resistant cast aluminum. One-piece molding means less chance of breakpoints. Features: 3G HSDPA, EVDO, or EDGE/GPRS. 500MHz ARM 11 processor. Race through menu to get apps you want. Rich graphics. Linux/Java phone - available on some versions of the RAZR 2. Complete UI redesign. Crystal Talk noise-reduction technology. Talking phone. MP3 player with Windows Media capability. Highspeed USB 2.0. Stereo Bluetooth compatible with ROKR S9 headphones and front touchscreen. Google Maps application in cluded. Movies can be viewed portrait or landscape, multishot mode in still camera, "see what I see" video conferencing with live streaming footage. "Really simple," says Zander. Available in all technologies this summer. 10:45 - The new Moto Z8: this is the phone we saw Ed Zander using, which he calls the "media monster," a camera phone with cool bent slider action. "When form meets function this well, convergence becomes a reality. People want form to define function." Z8, 3.4Mbps. 2MP camera, video at 30 fps; first high-res screen with 16 million colors. HSDPA. Up to 4GB MicroSD card (10 movies); partnership with Universal Pictures; Bourne Identity preloaded; also working with Sony and Warner. Program it to download TV shows from DVR. SSX snowboarding will be preloaded at summer launch. Send photos to Flickr, MySpace or YouTube with just one click. "Complete out of the box multimedia experience; more capable than an iPod," says Jeremy Dale. Ships across Europe in June. 10:40 ROKR Z6: First true Linux Java product; solid feel "like Mercedes car door," says Jeremy Dale; music sync, music management, music enjoyment. Transfer speeds: download in less than 3 seconds. Storage capacity: external slot for 2GB cards (1,000 songs). Windows Media Player, album art, playlists. Simple "drag and drop" process. ROKR Modality: shut, it's an MP3 player with only keys for music; open it's a phone. Stereo audio, and stereo Bluetooth, with new pair of sweet red Bluetooth headphones (S9, to be included in-box in Europe). 10:25 Q8 and Q9 Introduction: Jeremy Dale - "At Motorola, we want devices to work for us rather than against us; single device, cell phone will be that device...Today we're announcing worldwide availability of Q8 and HSDPA-version of Q9. It redefines what a smartphone should be, Europe and other regions this summer. 3.6 Megabits per second, twice as fast as nearest competitor. Q9 is the fastest smartphone in the world today, and critically, where currency of the realm is time, speed matters." Q9 details: New ergonomic design; seven dedicated keys, adaptive display for sunshine and indoor situations, using dual light sensors not found on any other product in this space. Only 2MP camera smartphone; Windows Mobile 6; 325MHz processor that can handle three activities simultaneously; stereo speakers. "Beautiful slim design." 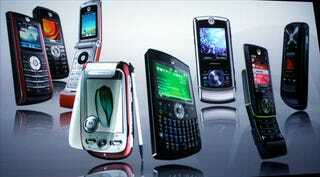 10:21 - What's after RAZR? Jim Wicks, corporate VP of design: "Motorola invented thin, and will continue to do thin. We do it right, without compromise. Going forward, introducing a layering effect on top of thin, through Linux Java, touch; more digital than mechanics. Modality: when in music mode, it transforms itself to look like a music player; when a camera, it will look like a camera. Going forward, the focus will be less about one particular product, more about a suite of products that define the brand. Going forward, best of hardware will be married to the best experience. The resulting behavior is what becomes iconic. In doing this, we're able to launch a suite of products with immediate impact: not thin for thin's sake, not arbitrary form factor - it's a rich experience." 10:17 Here's Ed! Introducing peeps that are making it happen. He says "products", plural. New and exciting products. Plural. For sure. 10:15am - Movie pf people with Moto phones - including Will Ferrell and a bunch of much prettier people. Motorola all over the world. Moto on QVC. Kanye and Moto. RED Moto (with Charlie Sheen?) Lots of drums. Moto: Big in Japan.